My face is so sore from grinning all day – every day – since we arrived on Sunday afternoon, I will probably have to have face therapy when we get back to Georgia. At first it was a little rainy, then a little windy, then a little chilly – but we couldn’t care less. We have been on a permanent Mackinac high, and it could snow for all we care – wouldn’t faze us a bit! All the clouds and showers and wind disappeared this morning, and it was one of those sunny, crystal clear Michigan early summer days. There’s been very little indoor time – all we’ve wanted to do is get outside and enjoy every minute. There’s so much to talk about! I’ve been very busy with my free lance work with Original Murdick’s Fudge, and for those of you who’ve been checking their web site each day for blog postings, just please be patient. I’ve submitted one already, and it should go up soon. I’ve also submitted quite a few photographs for them to use on their Facebook page. Those will begin posting soon also, so please go to their Facebook site and “like” it, so you’ll be notified of activity there. Ok . . . what have we been up to – besides work? So glad you asked! We’ve spent an unbelievable amount of time just talking to friends! You know Mackinac. 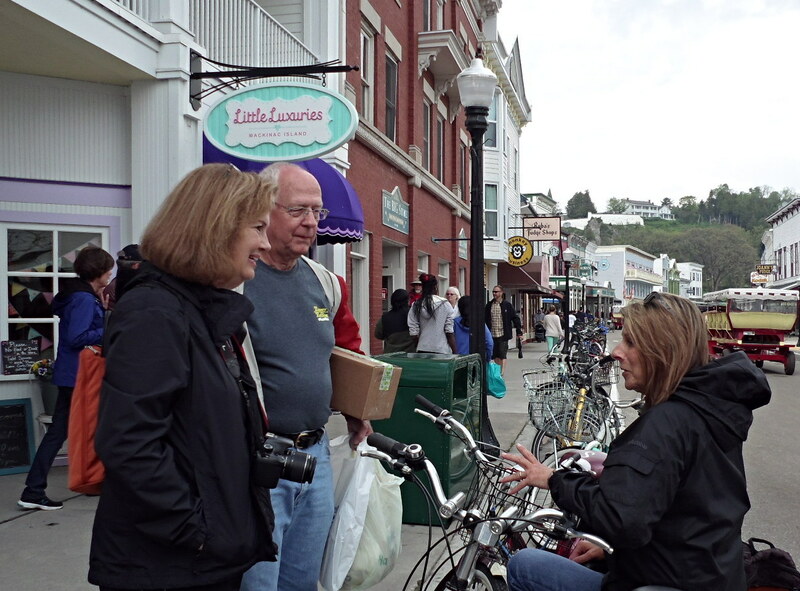 A walk to the Island Bookstore turns into a three-hour meet and greet trip. It’s so much fun seeing everyone again after being away all winter. Ted and I have felt so much love this week we are totally blown away. We arrived on the Island in time for Ted to help out again at the Community Foundation Celebration in Turtle Park last night. Bob Benser and the crew from the Chippewa Hotel are in charge of the food each year, and Ted has joined the crew for two years now. They packed up a dray in front of the hotel yesterday afternoon, stopped at the Grand for more equipment and supplies, then rode to the park to set everything up and start grilling. Coolers full of food, a grill, and other necessities – waiting for a driver before heading to Turtle Park. Over a hundred folks gathered for hamburgers and all the fixins’! The kids enjoyed pony rides and games, and one lucky child won a new bicycle! Bob Benser makes sure the food table is stocked and chats with a community member, as Rich Lind looks on. Since Ted rode up early on the dray, I was in charge of the afternoon dog walk and feeding. With the celebration scheduled to start at 5:00, I knew I’d have to leave downtown by at least 4:30 to get to the park. As usual things didn’t go as planned, and I walked out the door at 4:50. I started off, dialing the taxi stand as I walked. Once again, Dean answered the phone. Big – very big – dramatic sigh from me. “Where are you, Brenda?” Dean asked, and I could just see him shaking his head, wondering why I don’t plan just a little ahead for things like this. Yeahhhh! Two minutes later I’m on a taxi headed up toward the top of the island. I arrived in plenty of time to eat and enjoy all the festivities . . . and talk, talk, talk! I walked home alone, leaving Ted helping with clean-up. I confess . . . I could not walk by the condo. I took a path through the woods that brought me out at Surrey Ridge, where I turned down the hill without ever looking up toward our old place. Just couldn’t do it. The woods are full of Trillium! The Grand Hotel and Carriage Tour Stable and Carriage Museum looks beautiful against all the springtime green! The corral was full of horses, but I liked the way this one looked – standing alone under a beautiful white-blooming tree. How many times have I walked this road . . . . too many to count. Looking through the trees, across the Grand Hotel Golf Course to the Straits. The back porch of the Governor’s Summer Residence (no one was home). A crow stands guard atop the gate at the top of Fort Street. I will never, never, never tire of this view . . .
. . . or this one! The ticket booth at the lower level of Fort Mackinac – at the bottom of Fort Hill. At the bottom of Fort Hill I ran into a group of Village friends. So good to see them! Our castle for the week – in the heart of the Mission District. We love it! I could keep going, but it’s midnight, and my eyelids are closing between each word. More to come as the week goes on, and I’m sure I’ll still be writing about this week after we get home. We are so blessed to have this opportunity to be here right now, and I love being able to share it with all of you. Oh. Oh. Oh! Guess what happened today????!!!!! The first lilacs of the season bloomed . . .
. . . at the Mackinac Island Marina! Just in time for the Lilac Festival which begin June 6! This entry was posted in Mackinac Island and tagged Fort Mackinac, Grand Hotel, Mackinac Island Lilac Festival, Michigan Governor's Summer Residence, Original Murdick's Fudge, Trillium on Mackinac Island by bree1972. Bookmark the permalink. Love that you are on the island!!! Great pictures – I love the single horse by the beautiful tree. Enjoy your stay! !